At Mount Alvernia College we strive to deliver excellence in education through a curriculum that supports each student in her intellectual, spiritual, physical, cultural and social development. 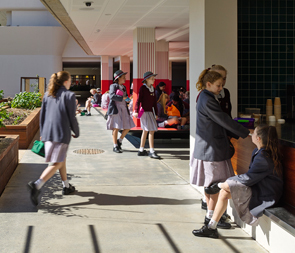 As a Christian school, our goal for education of a Mount Alvernian is to foster her growth to ‘full stature in Christ’ by nurturing her unique relationship with God, begun at Baptism and cultivated through her whole life. Outside the classroom, students have many opportunities to participate in Christian practice through prayer, worship and structured reflection. There is also an expectation that all will be involved in the social justice concerns of the College. Formal involvement in the student Outreach Committee, Franciscan Youth International, St Vincent de Paul Society, service learning, community visitation, and other practical activities is encouraged and affirmed. Through these pages you can read about how our girls grow their passion in social conscience, community and faith to live out the Franciscan values we hold so dear.